Discover the best mattress for arthritis in this article. The right option should help you wake up with less pain. Are you suffering from arthritis and dealing with a mattress that makes it even worse? Are you dedicated to finding a good option to help with your stiffness and pain? Choosing a proper mattress can help reduce aches and pressure, enabling you to wake up feeling more refreshed. This article will walk you through some of the top picks available on the market right now. The Loom & Leaf Relaxed Firm mattress has an all-foam design. But unlike some other memory foam beds, it also promotes temperature regulation and airflow. It has minimal bounce and allows you to sink into the surface without feeling too stuck. You want your mattress delivered and installed: If you opt for the Loom & Leaf Relaxed Firm mattress, it will come with White Glove Delivery Service. This means that professionals will not only deliver but install the mattress for you. You like to sleep on your side: This mattress will accommodate all sleeping positions, but side sleepers will likely find it extra comfortable. The foam supports a straight spinal position and cradles the shoulders and hips. 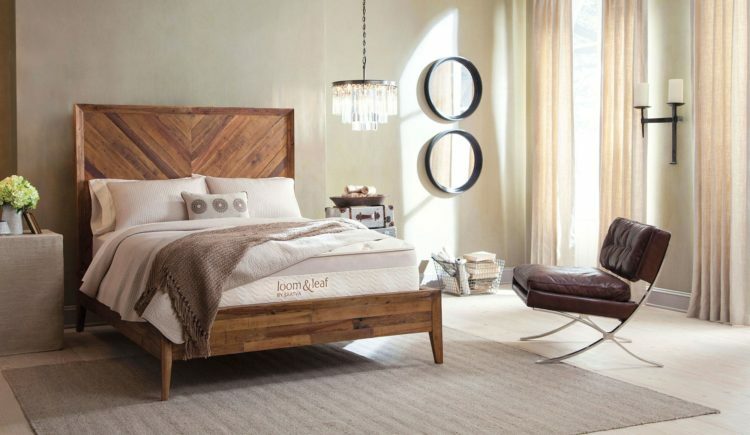 You get hot in your sleep: Loom & Leaf uses a few unique features that reduce and regulate temperature. If you tend to wake up feeling hot and sweaty, you’ll appreciate the egg crate design and cooling gel-infusion in the top layer of the mattress. You suffer from back pain: The Loom & Leaf Relaxed Firm bed is made with proprietary help reduce aches, which maximizes both temperature regulation and spinal alignment. If back pain is one of the symptoms of your arthritis, this should provide you with some relief. ​ We chose the Relaxed Firm version of the Loom & Leaf mattress since it will work for the widest variety of sleepers. Let’s look a bit closer at the materials used in the mattress construction to understand why it’s our top memory foam choice. The cover on the Loom & Leaf Relaxed Firm mattress is made with organic cotton and a thin layer of foam for a plush feel. Under this is a layer of convoluted (egg crate-shaped) gel-swirl foam for comfort and airflow. At the center of this layer is the previously mentioned Spinal-Zone gel panel for lumbar support. 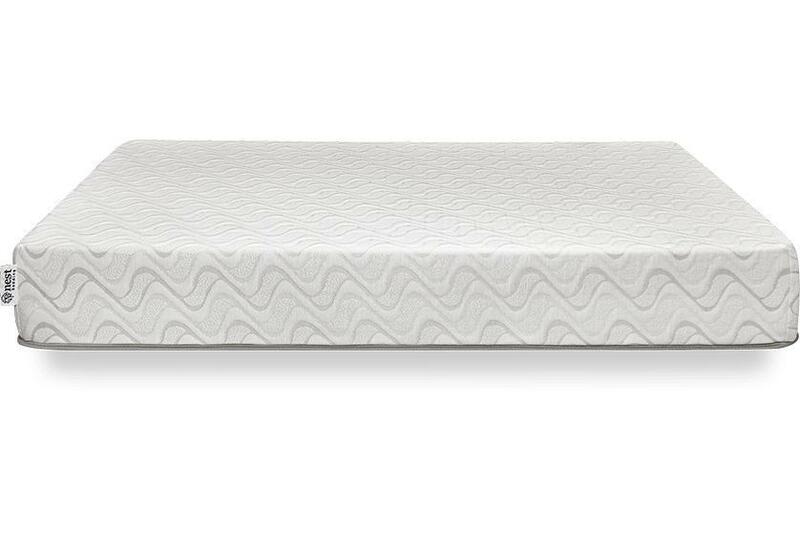 The next layer is 2.5 inches of visco-elastic memory foam for support and deep contouring. Under that is a transition layer, then 5.5 inches of dense foam that serves as a base and gives the mattress stability. 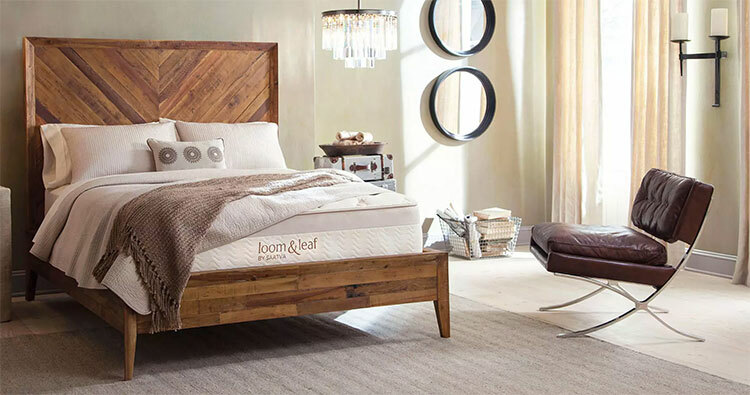 This mattress is a 6/10 in terms of firmness, which should accommodate most positions comfortably, but Loom & Leaf does offer a firmer option. Although you do slightly sink into this mattress, it also offers a supportive feeling without making you feel stuck. There is minimal bounce with the Loom & Leaf mattress, but the supportive base layer, quick-responding cover, and responsive transition layer make repositioning easy. Since it’s an all-foam construction, motion disturbance is virtually non-existent with this bed. If you sleep with a partner, you shouldn’t wake each other up when you move around. This mattress is CertiPUR-US® certified, meaning it’s free from dangerous levels of toxic chemicals. It comes with a 120-night sleep trial period and a 15-year warranty. If you’re looking for the cradling support of memory foam without too much sinkage or heat retention, this mattress should be a good option for you. 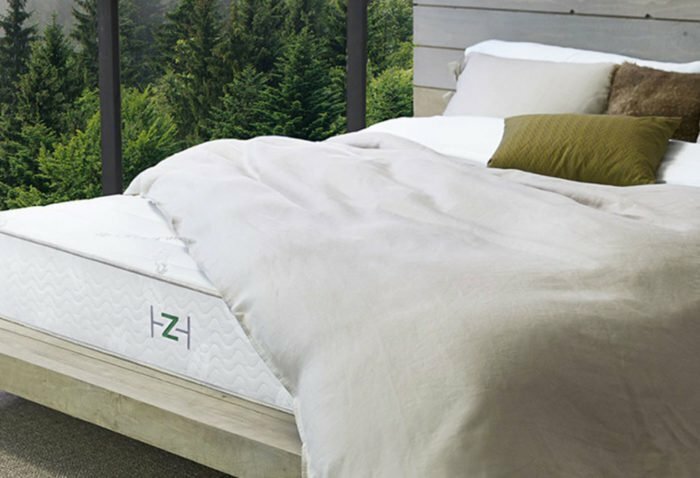 The Zenhaven Mattress is made from organic cotton, natural wool, and all-natural latex. We chose it as the best double-sided option because it has two firmness levels: Gentle Firm and Luxury Plush. You’re prone to allergies: If you’re sensitive to dust mites or prone to allergies, you’ll be happy to know that this bed is hypoallergenic. The Talalay latex used in the mattress construction is resistant to microbes and mold for a healthier sleeping experience. You aren’t sure which firmness level you prefer: A double-sided mattress makes it a lot easier to find customized comfort. If one side doesn’t work for you, you can simply flip it over and try the other. You want a responsive mattress: If you find memory foam too soft for your taste and would rather have a bouncy bed, you may like the Zenhaven Mattress. The latex used in its construction is very responsive compared to foam mattresses. Airflow is a big priority for you: Latex is one of the more heat-resistant mattress materials out there. It allows you to sleep on top of, rather than inside, the bed and the wool used in the Zenhaven mattress also promotes airflow and feels breathable. While back sleepers will probably do well with either side of the mattress, side sleepers may prefer the Luxury Plush side and stomach sleepers may want to choose the Gentle Firm feel. Below, we’ll detail the materials in the mattress construction starting with the Luxury Plush side, as this is the more popular of the two firmness levels. The bed is surrounded by an organic cotton cover, free from harmful bleaching agents. Under this is a single-inch layer of organic New Zealand wool, which wicks away moisture and improves air circulation. Next is a 1.5-inch layer of Talalay latex for comfort and spinal alignment. This layer is split into five different sections with different densities for better support. Under that is a 3-inch layer of softer Talalay latex, followed by another firmer 3-inch layer of Talalay latex. The fifth layer is a firmer latex layer that makes up the Gentle Firm top layer when the bed is flipped. The surface of the Zenhaven mattress responds quickly to pressure and the latex materials in it make it easy to reposition yourself. These materials combine to give you the feeling of sleeping on top of the bed rather than sinking into it. Latex isn’t as good as memory foam at absorbing motion disturbance, but the Zenhaven bed does perform well for motion isolation, in general. Even though it has a bouncy surface, disturbances won’t travel throughout the mattress. Zenhaven uses American latex, meaning they don’t have to order processed latex from other countries. This ensures that the company has a smaller carbon footprint. The Zenhaven mattress comes with a 20-year warranty and a 120-night sleep trial period. If you choose to return the bed, you’ll get a refund, minus a $99 transport fee. If you enjoy a bouncy mattress, value airflow when you sleep and want two firmness options to choose from, the Zenhaven mattress could be just what you’ve been searching for. 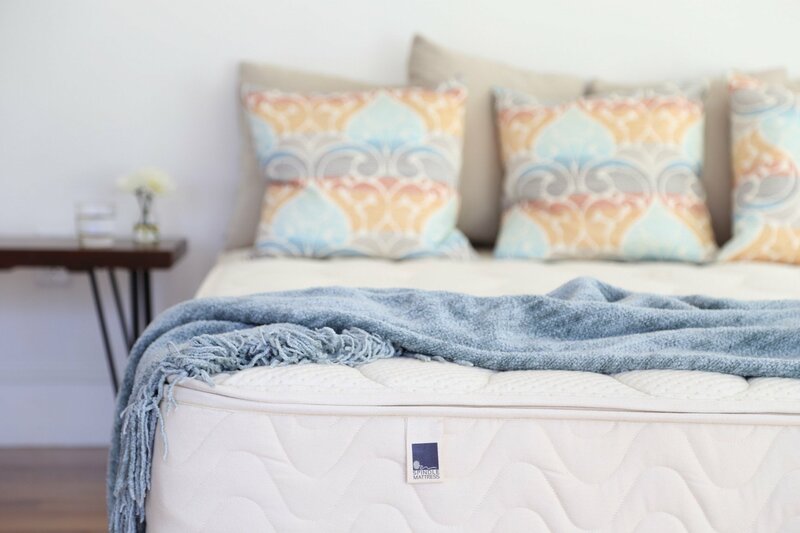 We chose the Nest Bedding Love & Sleep mattress as our best budget option because it offers cooling technology, a long warranty, and eco-friendliness at a great price. The medium version of the mattress will accommodate the widest range of sleepers and the cooling features should be much-appreciated by arthritis sufferers. You want a long warranty: The Love & Sleep mattress comes with a lifelong warranty, which can be hard to find with other brands. So, if having this reassurance from a mattress company is important for you, this bed could be a good choice. You like a bouncy sleeping surface: The responsive surface and supportive base of the Love & Sleep mattress give the bed a nice bounce. If you prefer this sensation over slow-responding foam, this mattress might be a good fit for your needs. You sleep on your back: The medium option from Nest Bedding is good for back sleepers because it keeps your spine straight while contouring to your lower back. If you suffer from back pain as an arthritis symptom, this should be a welcome feature. You want temperature regulation: The cover of the Nest Bedding Love & Sleep mattress is made with Thermic Phase Change technology that keeps you at a comfortable temperature. When you get hot, it helps to pull heat away from your body, then releases the heat again once you cool off. This mattress comes in tailored firmness levels, so you can choose the option that fits you best. If you sleep with a partner who has a different sleeping position than you, the medium should suit you both well. Let’s look a bit closer at the materials used in the mattress construction. The Love & Sleep medium mattress has a four-way stretch cover on top, followed by a 3-inch cooling Energex™ comfort layer for pressure relief. This material is designed to be bouncier and more breathable than memory foam. Under this is a layer of SmartFlow Air Flow foam with an egg crate shape to keep you cool. Next, there’s a 6-inch layer of dense support foam for stability and spinal alignment. This mattress is a 6/10 in terms of firmness and should accommodate the most sleeping positions. The cover has a cool, soft feel to it and the mattress allows you to sink in with comfortable contouring. Although this mattress does have some bounce, it won’t transfer motion too much and performs well in this area. The foams in the mattress are CertiPUR-US® certified and found to be free from harmful levels of heavy metals. The mattress is also GREENGUARD Gold certified, meaning it was found to be free from harmful levels of formaldehyde and other chemicals. The Love & Sleep mattress by Nest Bedding comes with a 100-night sleep trial period and a lifetime warranty. If you like a bouncy mattress and are looking for a budget option, the Love & Sleep medium mattress could suit your needs. If you aren’t satisfied, you can exchange it for free within 100 days of owning it. The Spindle mattress is the only option on our list that allows you to rearrange the layers of the bed for a customized firmness level. The top layer can be either soft or firm, but either way will cushion your joints very well, potentially easing arthritis symptoms. You’re a combination sleeper: Adjusting this mattress to the medium firmness level will accommodate all sleeping positions well. If you tend to move around in your sleep, this should be a good fit, no matter how you’re positioned. You have someone to help you with setup: Unlike some other mattresses, which come with minimal setup needed, the Spindle mattress requires a bit more work, initially. The bed arrives in three separate boxes. You sleep with a partner: The soft latex layers in this mattress are designed to absorb motion disturbances. If you sleep next to someone and you don’t want to wake each other up in the night, this is a welcome feature. You want a contouring mattress: The Spindle mattress contours to your body and can, as a result, alleviate pressure and pain. The softer layers of this bed may offer more targeted pressure relief than the firm layers, so keep that in mind when you set it up. If you find innerspring mattresses too bouncy, but memory foam a bit too soft, this should be a good middle ground for you. The latex mattress provides a plush sleeping surface but won’t make you feel stuck. The Spindle mattress cover is organic cotton twill with a fireproof barrier. The top, middle, and bottom layers of the bed are made of natural Dunlop latex and have varying firmness levels. Each layer is three inches thick and can be removed or substituted for another layer, which will alter the firmness of the bed, overall. Spindle has the Oeko-Tex 100 Class 1 certification for their latex, which is imported from Guatemala. This certification tests for harmful levels of potentially hazardous chemicals. The mattress comes with a 10-year warranty and Spindle will refund your purchase if you aren’t satisfied with it. However, instead of coming to remove the mattress for you, the company asks that you donate the mattress to charity after removing all identifying labels. Spindle definitely does things differently than other mattress companies, but it could be well worth it if you love the idea of adjustable firmness levels and have someone to help you set it up. The Bear mattress is good for combination sleepers because it supports the neck and lumbar region well and provides spinal alignment. People who sleep on their stomachs shouldn’t experience too much hip sinkage, and side sleepers will find that their hips and shoulders are pleasantly cradled. You already own an adjustable base: Some mattresses can’t be used with an adjustable base, but the Bear mattress can. Since it has an all foam construction, it conforms to different positions more easily than other beds. You don’t want an innerspring mattress: This is an all-foam bed, meaning that it’s completely free from coils. Even so, the Bear mattress has some bounce to it. You suffer from back pain: If persistent back pain is one of your arthritis symptoms, you may get relief from sleeping on the Bear mattress. The contouring, supportive materials in this mattress cradle your body for pressure relief in every position. You like being involved with charity: If you enjoy being involved with charitable causes, you’ll appreciate the fact that Bear helps children in America. The company has donated millions in sports equipment, as an effort to help kids get more active. Not only is this mattress good for multiple sleeping positions, but it also utilizes cooling technology. The cover is made with Celliant, a material that promotes cool and restful sleep. The mattress cover is non-removable but can be spot cleaned as needed. The bed is 10-inches thick altogether and gradually transitions from soft to firmer layers, starting from the top. 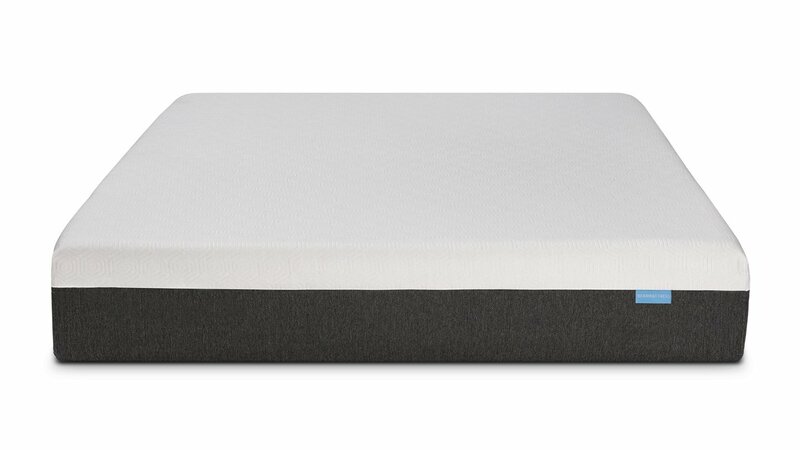 The first layer is a graphite gel-infused memory foam layer with an open cell structure for minimizing heat retention. Next, there’s a 1.5-inch layer of quick-responding foam for pressure relief and bounce. Under that is an inch of similar foam that is a bit firmer for added support, followed by a 5-inch layer of dense foam. The Bear mattress is a 6.5/10 level of firmness and should, therefore, suit most sleeping positions and weights. If you and your partner favor different sleeping positions, this should be a good middle ground for you both. The layers of this mattress are fairly responsive, although the 1-inch top layer responds a bit slower for contouring. There is very minimal motion transfer with the Bear mattress, so even light sleepers with pets or partners shouldn’t have a problem staying asleep on the bed. This mattress has a CertiPUR-US® certification and meets standards for hazardous chemicals and ozone depleters. It comes with a 10-year limited warranty and a 100-night sleep trial period. Just keep in mind that you have to try out the mattress for at least 30 days before you can return it. Overall, this is a versatile, arthritis-friendly mattress that should suit people of varying sleep position preferences, heights, and weights. If you like being involved with charitable efforts and don’t want an innerspring mattress, the Bear mattress could be worth trying out. When you’re looking for a new mattress as an arthritis-sufferer, the process may be a bit different for you than the average person. Here are some important factors to keep in mind. Firmness: The right level of firmness will depend on the sleeping position you favor, so make sure you know how firm your bed should be before choosing your new mattress. Back and stomach sleepers usually prefer a mattress with some firmness to it, while a side sleeper may prefer a medium or soft mattress, depending on their weight. Motion transfer: If you sleep with a partner, you’ll want to choose a bed with good motion isolation, such as a hybrid mattress or all-foam design. This will ensure that your partner shifting positions in the night won’t jostle your joints and cause pain. Repositioning: Chronic pain sufferers often move around a lot in their sleep. Try to find a mattress that makes repositioning easy instead of a struggle, such as a bed with a bouncy and quick-responding surface. Cooling technology: Feeling hot in your sleep can lead to restless, uncomfortable nights, which you certainly don’t need more of. Choose a mattress with cooling properties, like gel, convoluted foam or open cell technology, so you have a better chance of waking up rested.Overall, we think that the Spindle mattress is the best mattress for people with arthritis. Although the setup is more involved than the average mattress, the adjustable firmness levels are hard to beat. This could be an invaluable feature for someone who suffers from joint pain.